Watson Fothergill is known as one of the two key Victorian Architects of Nottingham, his buildings being instantly recognisable. This reputation is based, to a degree, on a handful of key ‘signature’ buildings in the centre of Nottingham built during the 1880s and 1890s – Queen’s Chambers on the Market Place, Jessop’s shop on King Street, the Rose of England on Mansfield Road, his own office on George Street, etc etc. These buildings are all distinctive – eclectic in nature, with a mixture of red brick, stonework and blue brick banding, dark timberwork, gables, turrets and chimneys – and represent the architect at the height of his career. However, as a new book reveals, Fothergill’s early career was dominated by his connections to Mansfield. During the 1870s he would design at least eleven buildings in the town (of which eight still survive), he would act as Consulting Architect to the Mansfield Improvement Commission (where his half-brother, Robert Mackie Watson, was chairman); and, through his wife, would inherit a significant proportion of the shares and property of Mansfield Brewery. Even in later life his connections back to Mansfield would be important, as it would be through his half-brother that he would be appointed as surveyor and architect for the Brunts’ Charity, going on to design the famous and much-missed Black Boy Hotel. Fothergill’s earliest works in Mansfield are not particularly well known. Following on from this Fothergill would design the shops at the rear of the Town Hall (now used by the Council); a shop on Albert Street (the offices of Harrop White Vallance and Dawson solicitors); and the Kings Arms on Ratcliffe Gate. His later works, such as the Cattle Market are more well known and in many cases are Listed. It is hoped that through greater recognition of his works of Mansfield, these important early buildings can be given the protection they deserve. I am interested in the Parsons Family. My family Butterworths lived in Mansfield and Alfred and Herbert went to Canada, Toronto, in 1857-1861. Alfred did land surveying on N Shore of Lake Huron with Charles Unwin (also of Mansfield) The names Parsons and Foster crop up in letters which they wrote home. I am trying to tie up the Toronto/Mansfield connections as there must be many. Samuel S Parsons born Uk 1828 is in a Census in Toronto with Charles Unwin in 1871. Did any of the Parsons go to America – there is a Polly Parsons and a Mary Parsons born in New York about 1845 also in a Toronto census. I would be grateful for any info you may have or are prepared to share. I can give you more information on the Parsons family if you wish. My grandmother was a Parsons, daughter of John Parsons, also a builder and lived some of his life in Nottingham. Stephanie he was my 2x greatgrandfather as well, and as far as I was told, by auntie Phyllis [King] yes he did build the Congregational church on Westgate,and as a child we lived in one of the big stone houses on Woodhouse Road and according to the deeds they were built by him as well, and Aunty Phil used to tell us were he had built as we were driving around wish I’d paid attention now. I know from various building plan registers that he built the villa on Nottingham Road that was until recently the Ukrainian Institute, and the neighbouring house on Commercial Gate plus a row of four houses at the bottom of Grove Street (demolished mid-70s). Hello Angela, yes, Fothergill was born at the Linden and lived there until his father passed away after which time he moved to Nottingham with his mother. His half-brother, Robert Mackie Watson, continued to live at the Linden until his own death in 1906. 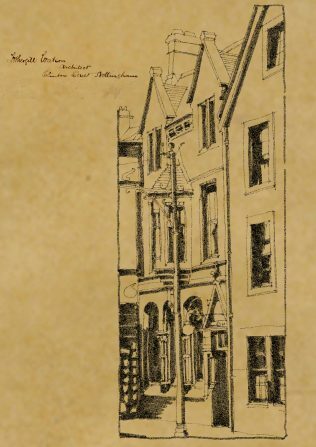 George Parsons is known to have built several of Fothergill’s designs, including the shops at the back of the Town Hall and the Congregational Chapel. The minutes for the construction of the chapel survive, and show that George was struggling financially (quite possibly because he reduced his tender figure from £6k to £4.5k) and not long after he can be found in the local press selling off his yard, surplus stock and the Villa he built on Nottingham Road (opposite to the Cattle Market). I’ve quite a few notes on him, but have never had a chance to research his family much, even his date of birth and home address eludes me. If you do have any bioggraphical information I am interested. I understand that Fothergill Watson (changing his name to Watson Fothergill) was born in Mansfield, and his family resided at The Linden on Chesterfield Road. The Cattle Market is listed due almost entirely, I believe, to the sterling efforts of the architect Alan Wahlers in the early 1990s – I think the original intention had been to demolish it along with everything else. His shop on Albert Street is also listed, whilst his Town Hall Shops and the Bank on Church Street (now part of the Swan) have protection by being in the curtilage of listed buildings. Three of his other surviving buildings, the houses on St John’s Street, the house on Nottingham Raod and the Villa at Crow Hill are all within Conservation Areas, which really only leaves the King’s Arms without any sort of statutory safeguards. I didn’t know Watson Fothergill designed so many buildings in Mansfield Darren but I’ve never looked into it. I only knew of two: the Congregational Church at the junction of Wood Street and Westfield Lane which was a very fine building. I remember it well from my youth but sadly demolished in the name of progress. The other one being Cattle Market House which has fared a lot better. Is there a preservation order on it? I hope so!